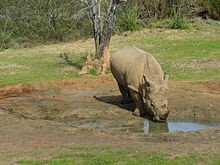 Both black and white rhinoceroses are actually gray. They are different not in color but in lip shape. The black rhino has a pointed upper lip, while its white relative has a squared lip. The difference in lip shape is related to the animals' diets. White rhinos graze on grasses, walking with their enormous heads and squared lips lowered to the ground. White rhinos live on Africa's grassy plains, where they sometimes gather in groups of as many as a dozen individuals. Females reproduce only every two and a half to five years. Their single calf does not live on its own until it is about three years old. Under the hot African sun, white rhinos take cover by lying in the shade. Rhinos are also wallowers. They find a suitable water hole and roll in its mud, coating their skin with a natural bug repellent and sun block. Rhinos have sharp hearing and a keen sense of smell. They may find one another by following the trail of scent each enormous animal leaves behind it on the landscape. 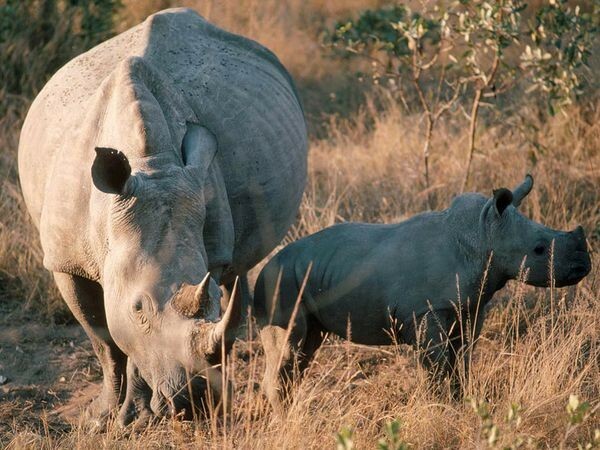 White rhinos have two horns, the foremost more prominent than the other. Rhino horns grow as much as three inches (eight centimeters) a year, and have been known to grow up to 5 feet (1.5 meters) long. Females use their horns to protect their young, while males use them to battle attackers. The prominent horn for which rhinos are so well known has been their downfall. Many animals have been killed for this hard, hair-like growth, which is revered for medicinal use in China, Taiwan, Hong Kong, and Singapore. The horn is also valued in North Africa and the Middle East as an ornamental dagger handle. The white rhino once roamed much of sub-Saharan Africa, but today is on the verge of extinction due to poaching fueled by these commercial uses. Only about 11,000 white rhinos survive in the wild, and many organizations are working to protect this much loved animal.